We created this beautiful diamond ring for a client this season. Crafted in Platinum, we have a certified Center diamond weighing 5.25 carats flanked by 2 diamonds weighing 1.75 carats each. Total diamond weight is 8.75 carats and all diamonds came with certificates. A very lucky person got this ring, and she is crazy about it. We can make one for you too! Marshall Granger Jewelers is proud to announce that in addition to fine estate and antique jewelry, they now have access to a large collection of fine pre-owned and reconditioned Rolex timepieces that are priced to sell. These watches have undergone a thorough inspection and professional cleaning to make them "like new." This collection has a 3 year limited warranty on each timepiece and can be a great Holiday gift for the man or woman in your life. Enjoy the luxury of owning one of the world's most recognized watch brands, Rolex. Each watch is hand made with exacting precision in Switzerland. Rolex uses the finest in metals, from 18 Karat gold and Platinum. Each timepiece is precisely manufactured and meticulously finished to be not only a fine watch, but a piece of fine jewelry to be worn with pride and distinction. Marshall Granger Jewelers is not an authorized Rolex USA dealer and does not represent to sell new Rolex watches. All watches are pre-owned and reconditioned. All carry a 3 year warranty from the dealer, but there is no warranty from Rolex USA or any subsidiary or affiliate. It's that time of year when family heirlooms are given. And wouldn't it be nice to add to your collection with an heirloom from the past. All year we have been buying jewelry from people like you. We've amassed quite a collection, and with several of our showcases filled with one-of-a-kind antique and pre-owned jewelry, you are sure to find the perfect item for your loved one. This year, for our 4 day private sale (Dec 1-4) we are offering our entire collection of estate jewelry at incredible pricing, most are below wholesale cost. We've personally inspected and cleaned and restored these items to like new condition, and now they are ready for you to select your next heirloom gift. Whether its a classic strand of pearls or a classic Rolex watch, or even that perfect bracelet to go with that perfect outfit, you can find that gift at Marshall Granger Jewelers. Stop in over the next few days and see what we've been buying... and now selling. If you have an item you'd like to sell, bring it to us and let us look at it. We might be interested, and you might be surprised at what you've had sitting in that jewelry box all these years. Welcome to our new Website and Blog! We hope you can come back and visit with us often, as we update the site and blog with interesting articles and hopefully brilliant gift ideas. We will feature articles from several of our staff members and perhaps some special guests on occasion. Some will be informative in nature, talking about gemstones and jewelry fashions. Some may be about specials and sales we are having. And some will be about what we observe in everyday life as part of a jewelry store. We welcome your feedback on our site and blog, and hope you'll join us often. Thank you for visiting us, and come on out to the store and say hi! We'd love to meet with you and help you. 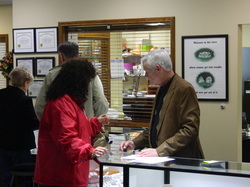 3rd Generation Jeweler, Owner Marshall Granger Jewelers.